Eduventures conducted research to better understand the views, attitudes, usage, and future demand/ownership of various technologies and brands among college students. The research, conducted via a Web survey, targeted 18- to 24-year-old students enrolled full-time at a four-year college or university. 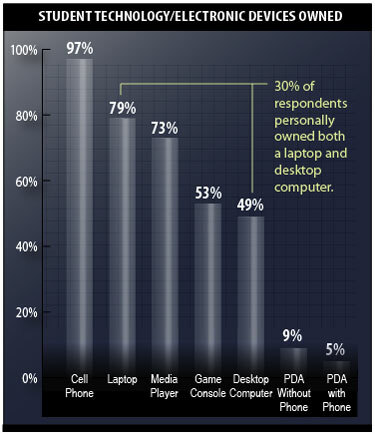 Among students responding to the question, which of the following devices do you currently own, 79 percent own a laptop compared to 49 percent who own a desktop; 30 percent own both. In addition to the information shown on the graph above, the research also found that most students spend up to five hours a day on the Internet, with a fairly even distribution between personal and school use, and e-mail remains the most popular communication tool and the preferred method of contact for all school purposes.